Women are not irrational; they are relational. Forum for Social Economics (http://www.springerlink.com/content/1w885686112kt7r7/), May 2008. Having discovered that the distribution of ownership rights over income and wealth is an integral part of economic theory, the question becomes: What are the tools to obtain the desired pattern of distribution of income and wealth? This is the eminent question of economic policy. Economic theory tells us that, once this pattern is set, most other questions of economic policy are automatically settled. The answer to the question is well known. Even though the historic roots of economics lie in moral philosophy, economists have lately assumed that they have nothing to contribute to the discussion concerning the selection of patterns of distribution of income and wealth. They have left the field to lawyers, ethicists, philosophers, sociologists, and political scientists. Mainstream economists believe that they do not have—and, what is more important, they ought not to have—any tools to control the pattern of distribution of income and wealth. Mainstream economists assume that this is a given, namely a determination that is and ought to be left to society as a whole. Economics, as pure science, as an autonomous mathematical science, is supposed to analyze the effects of various societal decisions, but not to intervene in those decisions. It is a direct consequence of this assumption that economic theory is fast becoming socially irrelevant. Under these conditions, the discussion on economic policy falls into a trap. The discussion becomes the property of various schools of economics, each purporting the benefits of its own dictates and none being able to convince the other schools of the validity of its positions. We do not need to put a step on this slippery slope. Once it is established that the pattern of distribution of income and wealth is an integral part of economic theory, the analysis is restricted to this question: How can we translate economic theory into economic policy? In the paragraphs below we will offer a set of new/old tools for consideration. This set calls for the construction of the theory of economic justice, and therefore economists will discover that they have much to contribute to it. This is the high road to re-establish social relevance to economics. A mere glance at the history of economic thought makes us glean this proposition: The transmission belt that for millennia carried economic theory into economic policy is the doctrine of economic justice. While remaining astonishingly constant from Aristotle to the Doctors of the Church (see, e.g., Wood 2002: 83), this understanding allowed for continuous adaptations to the circumstances of the moment. The doctrine of economic justice was divided into two planks: distributive and commutative justice. Distributive justice guided rules and regulations that govern the division of wealth as it is created; commutative justice guided rules and regulations that govern the transferal of wealth between buyers and sellers at the moment of the exchange. While the Doctors of the Church left much room for discretion in the determination of distributive justice to the parties involved in the economic process, they reached a firm and revolutionary conclusion about the dictates of commutative justice. The commutation of wealth, namely the exchange, occurs in accordance with principles of justice, they discovered, only if it reflects a free market price: a price determined in a market that is not dominated by either governmental or private monopolistic forces (see, e.g., Schumpeter 1954: 98-99). While this formula appears simple, it envelops great complexities. With it, the Doctors of the Church unified the social requirements of freedom with those of morality in economics; and it was the exercise of morality that yielded freedom. The application of this formula created the essential conditions for the enterprise system to be as free as it could be at the time. Over time, this ordered set of priorities was twisted around and its power dissolved. Through insistence on unfettered economic freedom, the unity of freedom and morality—with its inherent social relevance—was shattered and the doctrine of economic justice was lost in the fog of time. Figure 2 reads as follows. Participation in the economic process is a matter of justice, because only men and women who participate in the production of wealth are entitled to the distribution of ownership of a share of the wealth created through their participation.3 A just commutation of wealth, a just exchange, is implicit in the very distribution of wealth in accordance with one’s participation; but, of course, the principle of commutative justice extends itself to cover the exchange of wealth just created for other wealth existing on the market. It is in accordance with these objective principles that the pattern of distribution of current income and wealth is and ought to be determined. Economists can render these calculations very precise. But economists have much broader tasks than these. Figure 2 is a mirror image of Figure 1. If the distribution of ownership rights is an inherent part of the economic process, as we have seen in the previous section, economic justice becomes a natural extension of economic theory. Indeed, one can just as soon separate economic theory from economic justice as one can separate a person from her shadow. (The forced separation of these two entities has ineluctable consequences of its own that ought to be of great interest to the investigative powers of the economist.) Given this condition, a minimum set of questions to be asked by economists in the formulation and evaluation of any economic policy might be: Does the proposed policy favor participation in the creation of wealth? Does it allow for a fair distribution of the wealth thus created? Does it allow for a fair transfer of wealth from one person or group to another? Much could be said on these issues, but since much is already well known, we shall shun away from broad and elaborate discussions of these issues. The wisdom of staying away from broad and elaborate discussions, however, does not necessarily require staying away from the specifics of the case. The specific question is: How can we transfer the principles of economic justice into the complexities of the modern economy? Needless to say, this is a question that is not formally and comprehensively raised in mainstream theory. This is a question that arises naturally and forcefully within the context of the structure of Concordian economics. In the section on economic theory we have seen how does the economic system create wealth, how its value is determined by economists and accountants, and how its value is then transformed in ownership rights by lawyers. In the section on economic policy we have observed how economic justice determines the apportionment of those ownership rights. In this section we shall observe how the economic system operates in practice. “High” mainstream theory is silent on the practices of economics. This neglect is not due to chance; rather, it is due to the assumption that, since economic practices are determined by society at large and are supposedly controlled by allied social disciplines, they lie outside the economist’s field of expertise. Indeed, having abandoned the field to lawyers, and ethicists, and philosophers, and sociologists, and political scientists, mainstream economists have become passive takers of a proposition that lies at the very core of the issue. This is the proposition that present ownership rights provide practical rules for the distribution of future ownership rights. The proposition has long legs, because it determines the pattern of future distribution of income and wealth. Economists observe every day the manifold negative consequences of this belief, but feel powerless to even address the issues. This is another juncture at which, by taking themselves out of the discussion, economists are threatening to make economics a socially irrelevant discipline. To regain their power, economists have only to look at it as an economic, rather than a legal, political, or moral issue. If they do that, they discover that their assumptions are faulty. The error is elementary. The reasoning is circular. In order to enter and to break this circular form of argumentation, namely that present property rights determine future property rights, economists need to remember that property rights are pieces of paper: a piece of paper does not—and cannot—create real wealth. It is not even the exercise of property rights that creates real wealth. Property rights are a bundle of rights that link human beings to things. Their current owners may wish as hard as they can, it is not in the nature of property rights to create wealth. First, the content of these three entities is different. The object of property rights are marketable things, tangible or intangible things such as material goods and services. The object of entitlements are human needs, from food to shelter to health. The object of economic rights are economic needs. Second, the legal form of these three entities is different. Property rights are concrete legal titles over existing wealth; economic rights are abstract legal claims over future wealth; and entitlements are moral claims on wealth that legally belong to others. Finally, the quantity that they measure is variable. While both property rights and entitlements relate to existing wealth, and therefore a necessarily finite quantity, economic rights relate to future wealth, an unknown and elastic—if not a potentially infinite—quantity. Economically, and consequently legally, real wealth is created by the exercise of economic rights—indeed, economic rights and economic responsibilities, as we shall see. Hence economists are fully entitled to extend their competence to the field of economic rights and economic responsibilities. Economists will discover that the field is wholly within their range of expertise and responsibility. At the end of this journey, economists shall be able to offer to lawyers, ethicists, and philosophers, as well as political scientists and politicians, this proposition: Future ownership rights are determined, not by property rights, but by economic rights—indeed, they are determined by economic rights and economic responsibilities. Thus the closed circuit that at present imprisons economic theory, the proposition that property rights beget property rights, is broken. Economists are in charge of economic issues. The transmission belt that carries principles of economic justice into the complexity of modern economic life, and shapes objective guidelines for the formulation and evaluation of just economic policies is the presence of economic rights and economic responsibilities (ERs&ERs), both lodged in the same person at the same time. These two conditions need to be clarified. Economic rights and responsibilities need to be lodged into the same person, otherwise one does not follow an economic discourse in which everything is strictly related to everything else; rather, one follows escapism: if my father, my uncle, or the state is responsible for my welfare, we are lost, as Keynes used to say, “in a haze where nothing is clear and everything is possible” (Keynes 1936: 292). The second condition is equally important. Economic rights are rooted, not in abstract morality, but in our own concrete economic responsibilities (cf. Gorga 1999). 2. We all have the right of access to national credit. Since national credit is the power of a nation to create money, and since the value of money is given by the value of wealth left over by past generations and the creativity of every person in a nation, national credit is the last frontier, the last commons. Without access to credit today one is made economically impotent. Worse, since this advantage is granted to the privileged few, it is automatically denied to the majority of the population who are henceforth condemned to pay a higher rate of interest, if they obtain credit at all. Of course, such a loan should be extended only on the basis of the responsibility to repay the loan. And these loans will have a high chance of being repaid because they ought to be issued at cost and issued exclusively to individually owned enterprises, Employee Stock Ownership Plans (ESOPs), and cooperatives, as well as states and municipalities, and issued exclusively for capital formation, namely for the creation of new wealth—not to buy financial paper, consumer goods or goods to be hoarded or to cover administrative expenses of states and municipalities. Capital credit liberates people, while consumer credit enslaves them. 3. We all have the right to the fruits of our labor. This right should not be limited to the right to obtain only a wage. It should be extended to cover the other major fruit of economic growth over time: capital appreciation—as well as being subject to capital loss, of course. The only justification for reserving capital appreciation for stockholders, the owners of a corporation, and excluding workers from it, can be found in the fact that loans are given only to owners of past wealth (the Catch-22 of today’s economic reasoning: “save and invest and you too can become rich”—as if this proposition were either economically feasible or ecologically sustainable.) But from now on this right can be extended to people who do not have prior wealth through the right of access to national credit—especially by legally transforming workers into owners through individually owned enterprises, Employee Stock Ownership Plans (ESOPs), and cooperatives. Of course, this full right should be extended only in correspondence with the responsibility to offer services of valueequivalent to projected compensation. And there will be an outpouring of such services because, while in a command and control economy workers are requested to check their brain at the factory gates, in a socially responsible economy—an economy in which rights are exercised on the basis of responsibilities—workers/owners are legally, socially, and psychologically empowered to exercise their brain fully at their work post. 4. We all have the right to protect our wealth. This right seems to be universally accepted, except in one case that matters most: in the case of the trustification process, the process used especially after the Civil War in the United States to create corporate trusts and repeated in a hundred subtle variations ever since. (People feel free, not only to acquire shares of the stock of one corporation, but free to use that stock to acquire another whole corporation by all forms of trusts, mergers, and acquisition. The very idea of the corporation, forever a public entity, has thus been privatized and monetized.) There are two ways in which corporations grow: One is through internal growth, and this approach ought to be protected in no uncertain terms; the other is through external purchase and, with limits, this manifestation ought to be prohibited in no uncertain terms. Why? Because this prohibition is the only certain way to protect the wealth of present owners. And if it is assumed that most stockholders of the modern corporation are happy to have their shares bought and sold on the market, it must be granted that growth-by-purchase takes wealth away from workers who have contributed to create that value—and many times, in the trustification process, lose their work site as well. All in the name of efficiency—a misnomer that stands for private financial gain generated at the expense of shifting costs onto the shoulders of the community at large. Of course, this right ought to be purchased only at the cost of the responsibility to respect the wealth of others. These are two-way streets. We cannot even attempt to restrain the Pac-Man economy, while we use Pac-Man instruments. These economic rights and responsibilities can be exercised by anyone who does not only want to receive economic justice, but also wants to grant economic justice to others. Indeed, these are the essential conditions for the establishment of economic justice, as well as the establishment of a free enterprise system, in the modern world. As a consequence of the dynamics of the implementation of these four marginal changes in our current practices, economic freedom will be expanded to embrace all who want to subject themselves to the rigors of the economic process—and then the few remaining hard cases can be easily taken care of by charity. No. There is no compulsion in any of the above suggestions. The landowner can pay more taxes and control more land or can escape the tax levy altogether by reducing land ownership to zero; the applicant for a national loan can escape the constraints suggested for access to national credit by tapping into private capital markets; the worker can escape the responsibilities of ownership by vying for a job rather than an equity position; and the owner of physical capital can escape the constraints implicit in the proposed anti-trust policy by remaining below the trigger of an agreed-upon threshold for growth-by-purchase prohibition. This prohibition should apply to the largest corporations first and be gradually expanded to include eventually all except, let us say, corporations engaged in intrastate or regional commerce. Operating as tipping points in our modus vivendi, ERs&ERs will set in motion a process of interdependence that respects the reality of economic affairs, and the reality of human relationships. Recognizing that most people and most businesses always act morally, the increasing number of “bad apples” that at times seem to receive all the attention (and envious support) of a superficial intellectual world will be recognized as dangerous exceptions, perhaps ostracized, but certainly no longer applauded. Once the tendencies of these people are kept in check, all wealth will be distributed, not equally—that is meaningless utopianism—but fairly. The assurance for this result resides in the transformation of the current social contract into a legal contract: when landowners pay their share of land taxes, they will sell their hoards and access to land and natural resources will automatically be opened up for most people; when people will get access to national credit, many will become independent entrepreneurs; when workers are transformed into owners, they will have the legal tools to demand a fair distribution of income; when growth-by-purchase will mostly become a forbidden activity, most corporations and most employee/owners will preserve their independence. These measures, by consistently curbing the excesses of the few for a period of at least ten years, will cumulatively lead to a fair distribution of income and wealth. To reassure ourselves of this outcome, let us comprehensively look at the issues from another point of view. If land owners were to use their possessions of land and natural resources efficiently (with efficiency measured through lower private capitalization and higher effective demand), would there be such wanting in the world? If national credit were made available to all entrepreneurs at cost, would we not translate the immanent reservoir of creative powers into economically profitable ventures? If workers were transformed into worker/owners, would we not increase our extant productive capacity incommensurably? If corporate growth-by-purchase—with accompanying translation of that economic power into corruption of our political system—were curbed, would we not obtain less concentration of economic power into a few hands? All four ERs&ERs naturally lead to a fairer distribution of income than prevails today. Eventually, with a fair distribution of income and wealth, there will no longer be any need for redistributive programs, which are an expression of double utopianism (first, people as if living in la-la land are allowed to accumulate much, no matter how; and then they are expected to peacefully discharge their ill-gotten wealth). Preserving their current wealth, the rich will grow richer at a steady but slower pace; and the poor will no longer be poor, because they will have all they need. Lacking fuel at both ends, violent oscillations in the business cycle will be abated. We will thus recover the essential truth of economics. This is the truth that there are two conditions of growth: economic freedom and economic justice, as concrete expressions of freedom and morality. Both are essential. The relationship between the two is quite clear: While freedom does not necessarily bring justice with it, justice unavoidably brings freedom. One can abuse freedom by denying freedom to others, one can never abuse justice. Hence, the initial condition of freedom for all is proof positive of the existence of economic justice in the land. This is economics that is socially relevant. And the relevance is not an afterthought. The relevance is implicit. The social import of economic theory is realized when the distribution of ownership rights is seen as an integral part of its constitution; and the social import of economic justice and economic rights and responsibilities is simply stated: We must prevent all foreseeable injustices from occurring. Once an injustice has occurred, there is nothing that can be done to undo the dastard deed. This is the bosom of realism. One last question: Is the proposed program of action the latest expression of utopianism? The curt answer is: No. Utopianism has consistently been based on the wishful thinking of a single person. The proposed program of action results from filling in the gaps of a millenarian train of thought that, in a seamless web, extends itself at least from morality to economic theory and from there—through economic justice—to economic policy and practice. Utopianism promises immediate results, as if by magic. This proposed program of action asks for concerted, protracted effort. Whatever life Utopianism has, it is based on the fanatical following of a small group of people who try to force it upon the will of the multitudes. The proposed program of action is expected to be readily understood and spontaneously implemented by the multitudes. The lament that economics lacks social relevance assumes many forms, but these are mostly centered on the treatment of issues of distribution of income and wealth. We have found that these issues are not even investigated by economists today because they assume that they lie beyond the field of economics. Hence, by placing this issue at the very core of economics, we have given back social relevance first to economic theory, then to economic policy, and finally to economic practices. Without ever abandoning the field of economics, we have established a continuity of discourse between three stepping stones in economic analysis. We have followed this line of reasoning. Since money and financial instruments are not wealth, but only represent wealth, in macroeconomics one cannot add money to real wealth. The two have to be kept separate. This condition raises the question about the relation between money and real wealth. As in the economics tradition from Aristotle to the Doctors of the Church, we have recognized that money and real wealth must be equivalent in value. But equivalence is a formal relation among three terms. What is the third term? The third term that links money to real wealth is the economic value of ownership rights; hence, we have presented a restructure of economic theory that reflects the need to study not only the monetary economy but also the real and the legal economy at the same time. From this new framework of analysis, novel answers are given to the question: How is the distribution of ownership rights achieved today, and how “should” it be achieved? An investigation of the economic, rather than the legal, moral, or philosophical aspects of this question leads to the transformation of an age-old doctrine into the theory of economic justice and to the discovery that the creation of wealth is achieved, not through the exercise of property rights, which are static, but through the exercise of well-defined economic rights and economic responsibilities, which take care of the dynamic needs of the economic world. Every step of the way in Concordian economics, decisions are taken following relentlessly the dictates of fundamental rules of logic. For instance, analysis reveals that since current definitions of saving and investment contain items that are productive (farmed land) and items that are nonproductive (fallow land) of further wealth, both saving and investment respect neither the principle of identity nor the principle of non-contradiction and therefore they cannot be equivalent to each other, as they ought to be for their relation of equality to be formally valid (see, e.g., Allen 1970: 748). The separation of real wealth from monetary wealth is an integral part of the transformation of Keynes’ model into the series of mathematical models that provide structure to Concordian economics. This is a procedure that, outlined with the help of geometry (Gorga 2002: 32-37), starts with the enlargement of the definition of consumption from expenditure on consumer goods to spending in all its manifestations (ibid., 139-50), passes through the definition of money (ibid., 222) and the monetary formulation of the Flows Model (ibid., 309-12), and ends with the establishment of the equivalence of the processes of production, distribution, and consumption (ibid., 312-19). The description of these three processes and the economic process as a whole form the substance of Concordian economic theory (ibid., 159-234). What to do with the widow, the orphan, and the handicapped is a moral issue. Economics does not do anything for them. Indeed, as proved by the history of the world, even in the richest of the communities at the height of the business cycle, economics cannot do anything for them. Their number can become so overwhelming, their needs so vast, that even charity becomes powerless. Economics cannot do anything for the widow, the orphan, and the handicapped—unless, of course, they own stocks and bonds. But then they are not poor; they do not need any assistance through morality. They are capitalists and by the virtue of being capitalists, by the virtue of owning the machines, they participate—through remote control of the machines—by right in the economic process. Acknowledgments This paper is uniquely due to several maieutic interventions, truly beyond the call of duty, by Dr. Wilfred Dolfsma. I also would like to acknowledge a clarification brought to this paper by Godfrey Dunkley. If this paper has become a cogent presentation less exposed to potential debilitating criticism of single points, it is due to innumerable constructive suggestions by two referees of Forum. A more detailed background for this paper is contained in “The Economics of Jubilation”, an unpublished monograph that has been well received by such a diverse audience as Dr. Michael E. Brady, Dr. John C. Rao, Professor William J. Baumol, and Professor Roger H. Gordon. That work, in turn, is based on a framework of analysis which was greatly assisted for 27 years by Professor Franco Modigliani and 21 years by Professor Meyer L. Burstein, among others. Allen, R. G. D. (1970) Mathematical Economic, 2nd ed., London and New York: Macmillan, St. Martin’s. Blinder, A. (1999) Quoted in “Students Seek Some Reality Amid the Math Of Economics,” by Michael M. Weinstein, The New York Times, September 18, 1999, pp. A17, A19. Brady, M.E. (1996) “A Comparison—Contrast of J.M. Keynes’ Mathematical Modeling Approach in The General Theory with some of his General Theory interpreters, especially J.E. Meade”, History of Economics Review (25): 129-158. Fanfani, A. (2003) Catholicism, Protestantism, and Capitalism, Norfolk, VA: IHS Press. Ferrini, V. (2002) “Gorga worthy of note”, Gloucester Daily Times. December 11, A6. Gewirth, A. (1985) “Economic Justice: Concepts and Criteria,” in K. Kipnis and D. T. Meyers, (eds.) Economic Justice: Private Rights and Public Responsibilities, Totowa, N.J.: Rowman & Allanheld. Gladwell, M. (2000) The Tipping Point: How Little Things Can Make a Big Difference, NY: Little, Brown & Company. Gorga, C. (1959) A Synthesis of the Political Thought of Louis D. Brandeis. GraduationDissertationUniversity of Naples. Gorga, C. (1964) “Not Simply a National Fund, but a Stabilization and Development Fund”, Mondo Economico 19(14): 14-16. Gorga, C. (1982) “The Revised Keynes’ Model” (an Abstract), Atlantic Economic Journal 10(3): 52. Gorga, C. and Kurland, N. G. (1987) “The Productivity Standard: A True Golden Standard,” in Every Worker An Owner: A Revolutionary Free Enterprise Challenge to Marxism, D. M. Kurland (ed.) Washington, DC: Center for Economic and Social Justice. Gorga, C. (1991a) “The Dynamics of the Economic System,” unpub. man. Gorga, C. (1991b) “Bold New Directions in Politics and Economics,” The Human Economy Newsletter, 12(1): 3-6, 12. Gorga, C. 1994. “Four Economic Rights: Social Renewal Through Economic Justice for All,” Social Justice Rev. 85(1-2): 3-6. Gorga, C. and Weeks, S. B. (1997) “Fisheries Renewal: A Renewal of the Soul of Business,” Catholic Social Science Rev. 2: 145-161. Gorga, C. (1999) “Toward the Definition of Economic Rights,” Journal of Markets and Morality, 2(1): 88-101. Gorga, C. (2002) The Economic Process: An Instantaneous Non-Newtonian Picture, Lanham, MD. and Oxford: University Press of America. Gorga, C. (2007) “Economic Justice,” in Catholic Social Thought, Social Science, and Social Policy: An Encyclopedia,Lanham, MD: Scarecrow Press. Hayek, F. A. (1960) The Constitution of Liberty, Chicago: University of Chicago Press. Keynes, J. M. (1936) The General Theory of Employment, Interest, and Money, NY: Harcourt. Klein, L. R. (1968 ) The Keynesian Revolution, 2nd ed. New York: Macmillan 1968. Klein, L. R. (1970) “The Use of Econometric Models as a Guide to Economic Policy,” in Selected Readings in Econometrics. Cambridge and London: MIT Press. Manicas, P. T. (2007) “Endogenous Growth Theory: The Most Recent ‘Revolution’ in Economics,” post-autistic economics review 41:39-53. Mankiw, N. G. (2006) “The Macroeconomist as Scientist and Engineer,” Journal of Economic Perspectives 20:29-46. Nozick, R. (1974) Anarchy, State, and Utopia, NY: Basic Books. Rawls, J. (1971) A Theory of Justice, Cambridge, MA: HarvardUniversity Press. Schumpeter, J. A. (1936) “The general theory of employment, interest and money,” Journal of American Statistical Association (31): 791-95. Schumpeter, J. A. (1954)History of Economic Analysis,NY: OxfordUniversity Press. Thompson, J. M. T. (1986) Nonlinear Dynamics and Chaos, Geometric Methods for Engineers and Scientists, New York: Wiley. Warsh, D. (2006) Knowledge and the Wealth of Nations: A Story of Economic Discovery, New York: Norton. Wood, D. (2002) Medieval Economic Thought, Cambridge, UK: CambridgeUniversity Press. A basic assumption in logic is that the principle of equivalence formulates a relation among three terms. Yet, there is no recognized third term in physics that completes the established relation of equivalence between matter and energy. 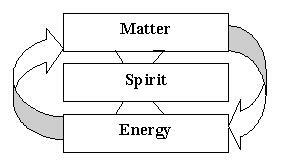 This paper suggests that the third term to which both matter and energy are equivalent can be posited to be spirit. Spirit is defined both as the link—as glue—that holds matter and energy together and as Spirit, a notion that is akin to the spirit of God, which is by definition everywhere. All three terms might eventually be measured by a calorimeter. If this application of the principle of equivalence is accepted, physics is transformed from a linear into a relational discipline. And then everything will change in the “two cultures”, namely in both the physical and the social sciences. Einstein established a relation of equivalence between matter and energy . An equivalence relation is composed of three distinct and separate terms. To the knowledge of this writer, so far there is no identified third term to which both matter and energy are equivalent. Hence the relationship is not formally valid yet. This paper proposes that the third term of the equivalence be posited to be spirit. After observing some of the canonical requirements of the equivalence relation and the fundamental advantages of casting our thought processes into this format for the force it brings to our reasoning, we shall first note the shortcomings of some potential solutions to the lack of formal validity of the equivalence of matter to energy and then we shall try to obtain an operational definition for the word spirit. Only then shall we observe some of the consequences of accepting the proposal of making spirit the third term of the equivalence. If the proposal stands to all the tests of validity, this solution will eventually yield two considerable benefits. It will transform physics from a linear into a relational discipline. It will also tend toward the reunification of the physical with the social sciences. Matter and energy are two terms. E = mc2 is not an equivalence relation; c2 is not a third term: c2 is a unit of measure (of speed). As logicians know, to be valid, an equivalence relation must be composed of three terms. The three terms have to be reflexive (namely identical to themselves throughout the discourse), symmetric (one observes the same entity from two points of view in order to obtain a deeper understanding of both entities), and transitive (a third term must exist to which both terms are equivalent in order to eschew the confines of circular reasoning and to complete the analysis). With the assistance of the equivalence relation the analysis does not start from an arbitrary point nor does it end at an arbitrary point, but is rigorously interlocked. These observations can be made more evident by specifying the progress of our thought processes and by casting them into a set of figures. Science eschews all singularities. There is a good reason for this practice. A single point, a single observation does not lead to an objective, replicable analysis or experiment. Analysis begins with the observation of two events. Yet, the observation of two events necessarily leads to circularity of reasoning. Once we are faced with only two observations, we are obliged to observe all possibilities. Hence the mind is led back to the exploration of all potential outcomes of the position of Point B on the circumference of the circle in relation to Point A at the center of the circle. This is a process that eventually leads to a reversal of one’s position and then to a return to the original position—and no certainty is necessarily acquired in the process. Therefore, science asks for a third term. The third term points the research in the right direction. However, if the third term is placed in a linear position, the end result might be a dispersal of the thought process into the empty infinity of an enlarged circle. Linearity leads to progressio ad infinitum. It is the equivalence relation that restrains the analysis from collapsing into infinity by constraining the terms into an interlocked relationship as in its standard configuration: A ↔ B ↔ C. The equivalence relation starts in logic and has the widest possible range of applications. All forms of syllogism are based on the equivalence relation. Hence the relation of equivalence is well known to the literati. The equivalence relation is also part and parcel of all mathematics textbooks. It stands at the very foundation of mathematics, in which three fingers of my hand (3 of base 10 number system) are equivalent to the word/number/symbol (three, 3, or III) and to the three apples in front of my eyes. A triangle is based on the equivalence relation. The whole of trigonometry is based on the equivalence relation. Indeed, as R. G. D. Allen pointed out, the rules of equivalence “hold” also for the relation of “equality (=)” . In brief, there are many reasons why it is essential to cast any scientific analysis in the format proposed by the rules of logic in general, and the principle of equivalence in particular. A few of them, not necessarily in their order of importance, are as follows. Logic, as a whole, provides objective criteria for the evaluation of any proposition; most disagreement, as is well known, disappears as soon as the magic words are pronounced: “But that is not logically tenable.” Logic provides guidance to our analysis; without it, we are rudderless. Guided by rules of logic, we know whether or not we have completed our analysis. Logic makes it possible to replicate the reasoning or the experiment. From the above it inexorably follows that the fundamental relationship that Einstein established between matter and energy is yet incomplete. Two terms do not make an equivalence relation. The relationship between matter and energy is completed only when a third element is found to which both matter and energy are equivalent. There are no explicit formulations of a third term to which both matter and energy are equivalent. As pointed out above, c2 is not a third term, but a unit of measurement of speed that has nearly nothing to do with light. It happens to be the speed of light; hence, at best, it is an attribute of light. By extension, it might be assumed that mc2 contains in it, not just the meaning of matter, but also—implicitly—the meaning of light. Even if c2 stood for light, it cannot be the third term because light is a form of energy (clearly in the wave conception of light; or a form of matter in the particle conception of light). Thus, whether light is an intrinsic component of E or m, it cannot at the same time be an extrinsic term to which either E or mc2 might be equivalent. It cannot appear as an addition to either side of the equation, without creating double counting and without violating the first requirement that each term of the equivalence must be reflexive, namely identical to itself throughout the observation. The addition of the term light does not make the construction symmetric; one cannot change the term light with the term energy (or matter) and obtain positive results: one does not gain a better understanding of either matter or energy. Neither does that addition make the terms of the construction transitive: from light one necessarily goes back to either matter or energy—not to both. These considerations can also be put in common language: a part cannot be confused with the whole. If light is part of energy or part of matter, light cannot be equivalent either to energy or to matter, because this definition would run into the impossibility of equating a part with the whole. Since matter and energy, to be equivalent to each other, must be whole units, namely units or entities all complete in themselves, the third term must also be a whole unit, a whole entity. It cannot be a part of a whole. The same considerations apply if the term third is assumed to be derived from the equation E = hν, where E is energy, h is Planck’s constant (which is equal to 1 and thus disappears from the equations of physics), and ν is the measure of the frequency of energy radiation emitted as photons, rather than the speed of light. A more abstract set of considerations are necessary to dispel the notion that space (like the old ether and the futuristic “higher order”) might be the third element of the equivalence. The third element has to have an existence of its own. Take away matter and/or energy and space disappears from our field of observation. Hence it cannot be the third element that would make the equivalence of matter to energy a valid relationship. We must search for a third term to which both matter and energy are equivalent. Figure 1 can be interpreted not only to mean that matter transforms itself into energy and energy into matter, but—at the very least—especially along these lines: The physical world in which we live has to be observed first from the point of view of matter and then from the point of view of energy. The essential prerequisite is to see these two aspects of reality not in linear fashion, but in a relational mode, namely as two separate and distinct viewpoints of the same reality. When that is done, one can also see that the total reality in which our daily existence is immersed can be grasped only if it is observed, not only from the viewpoint of matter and energy, but also from the viewpoint of spirit. One enters into the stone with a hammer; into the energy of the stone with a cyclotron; and into its spirit with prayer. Thus we come back to the very roots of our civilization. Our ancestral ancestors—not unlike many brothers and sisters in many civilizations of today—started their analysis of the world neither from matter nor, certainly, from energy. It is fairly certain that they started their analysis of the world form the point of view of spirit. But what is spirit? Can we obtain a precise definition of this term? Can we obtain an operational definition of this term? Spirit is incommensurable. Therefore, it is difficult to define. Once it is realized, as we shall more clearly see below, that mathematics, the most precise of all sciences proceeds on the basis of two incommensurable entities, namely zero and infinity, this inherent difficulty that is presented by the word spirit ought not to be of much concern to a physicist. That said, we shall try to identify some of the characteristics of spirit. As used in this paper, spirit is a relation, the relation that binds matter to energy. It keeps them both factually together and intellectually separate from each other. With the word spirit, we can stop thinking of the universe as a linear relationship in which matter somehow passes into energy, and we can start conceiving of the universe of matter being in organic relationship with the world of energy. We can study the objective reality first as a world of matter and then as a world of energy. These are all enclosed worlds of their own. If we conceive of both matter and energy as two entities, indeed as two worlds, in their own, without their individual link to spirit, they would both be in fatal conflict with each other. Instead, we notice near perfect and continuous harmony between the two entities. This we might say is an attempted definition of spirit in the small, as in “the spirit of this stone”: spirit is the link, the glue that holds matter and energy together. By trying to define spirit in the large, as an infinite entity into which both matter and energy are encompassed, and indeed as an infinite entity in which we—observers—are all encompassed, we might gain a greater control over the forces of this world by regaining the sense of what used to be called the “sacred”. Only if the earth is seen as sacred again will we feel obliged to respect its inner existence. It is through the word spirit that we reach a better understanding of both matter and energy. Through that word, we enter deeply into their essence and we get in close contact with each of them. In an age in which we are discovering the essential importance of a sound ecological management of the planets, the word spirit will incite us to gain a greater respect for the world of matter as well as the world of energy than we have at present. Thus the word spirit has a theoretical as well as an operational validity. And then it can inexorably be observed that the infinity of spirit manifests itself to us most clearly as both matter and energy. Hence, the preeminence of the study of physics in today’s culture is no longer surprising. But spirit does not manifest itself only as matter and energy. It also manifests itself, indeed, as spirit. Man’s mind has forever been engaged in the attempt to define “spirit”. We must admit that the task has eluded us. And there is a very good reason why the task is destined to elude us forever. Spirit is not an intellectual affair, hence it can never be caught by the intellect. Since it is an intensely personal relation, indeed an intensely personal affair, the essence of the word spirit can only be caught by our feelings. This is the fundamental reason why approximation to the understanding and explanation of spirit have been in the past the prerogative of mystics, theologians, philosophers, literati, and musicians. As the practitioners of these disciplines have forever made an attempt to convey their understanding of spirit to all other people who may be interested in the topic, so physicists in the future—as they have indeed done in the past (see, e.g., Aristotle and Thomas Aquinas)—have to try to convey to the practitioners of the spirit the goodness, the truth, and the beauty that they discover in both matter and energy. One could define spirit as Spirit, namely as God. However, this definition might be misleading; it might lead into the old pitfalls of pantheism. To avoid such dangers, it is necessary to distinguish God from God’s spirit; it might be necessary to say that God is also spirit; and then one must be careful to limit God’s presence in matter and energy by saying that the spirit of God is also in matter and energy, also in the stone and its energy. If God is by definition everywhere, then—given the above qualifications—it is possible to say that God is also in the stone and in its energy. And then one surprising result ensues: a very practical consequence indeed. It appears that all three entities, namely matter, energy, and spirit might share the same unit of measure: degrees of heat. One of God’s characteristics is to be in essence love, Love par excellence. And is not warmth and heat one of the most endearing physical manifestations of love? Not being a physicist, this writer can suggest some of the implications for physics of establishing a true equivalence between matter, energy, and spirit only at a very broad level of generality. When one multiplies the mass by the square of the speed of light, when one spins matter at the squared speed of light, one no longer observes matter but energy. One is no longer in the world of matter, but in the world of energy. One has made such a definite break between the two worlds that, in order to achieve clarity of mind and expression, one must accordingly design a new nomenclature. Using words from one world and applying them to the other leads to analogical thought, but not to innovative and incisive thought. The second consequence that this writer can envisage is the need to jettison the old attachment to absolute quantification. Quantification in physics has always taken place within sharply defined limits. One has simply to resign to the nature of things that this is the only type of quantification that might forever be viable in physics. In order to reduce the level of apprehension about this condition, physicists will want to notice that mathematics too has always been subjected to this condition. If one does not see the number system as a linear but a relational organization of numbers, it becomes clear that mathematics is based on the following foundational equivalence: 0 ↔ 1 ↔ ∞. The first impression is that mathematics has been able always to proceed with the quantification of only one of its terms: namely, the number 1. Mathematics does not, and cannot quantify either zero or infinity. And it does not matter. Indeed, on second thought, mathematics does not quantify the third of its foundational terms either; mathematics does not present us with an absolute quantification of one, but a relative quantification of one. Numbers proceed from (plus or minus) one to infinity, but they never touch infinity; the conception of the limit is there to recognize this deficiency and to allow us to work within the limits offered by reality. Thus, taking a leaf from the transition from Galileo and Newton to Einstein through Hume in relation to space and time , we shall not be concerned with absolute but with relative quantification. What we measure is its mass and its length in relation to man. Then, man—indeed, every man and woman—is again positioned at the center of the universe. where a· = rate of change in the first element of the relationship, b· = rate of change in the second element of the relationship, and c· = rate of change in the third element of the relationship. From the linear world of rationalism, thus everything is transformed into the organic world of relationalism. Above all, beyond changes of perspective in physics, if this construction of reality is accepted, the warlike relation between the “two cultures” is expected to change and eventually to come to a screeching halt; with time, this war—with its multifarious manifestations of reductionism, materialism, and atheism, and, above all, mutual misunderstandings—will unavoidably come to a screeching halt. While waiting for a response to these observations from the people of science, we already know the response from the people of spirit. Poetry and philosophy have spoken forcefully about the evident relationship between matters of the earth and matters of the spirit . Since this writer is more familiar with the Catholic tradition, he will limit himself to one quotation from within this belief system. But many other expressions come easily to mind. “Every culture,” Christopher Dawson wrote, “is like a plant. It must have its roots in the earth, and for sunlight it needs to be open to the spiritual. At the present moment we are busy cutting its roots and shutting out all light from above” . If mathematicians and physicists, following strict rules of logic that they already obey in all steps of their reasoning, can be convinced that their own fields—as moral theologians insist—are all immersed into the world of spirit, all other scientists, especially social scientists, will not take long to follow suit. After all, it was Einstein who said: “Science without religion is lame, religion without science is blind” . There are many indications that the world of linear, rational, Cartesian logic has come to an end—see, e.g., John Lukacs, At the End of an Age . This is a world in which reality is reduced to isolated atoms. The principle of equivalence is a ready-made tool that allows us to escape the strictures of Cartesian logic and leads us into the world of relational logic, a world in which everything is naturally related to everything else. This paper has used this principle and reached some novel conclusions in relation to physics and mathematics. In the process, it has laid the groundwork for healing the ongoing schism between the “two cultures”. The reader might be interested to know that this paper was not written with the Shroud of Turin in mind. Yet, at one point it became apparent to this writer that the paper makes the Shroud a logical and “natural” necessity. Even the Transfiguration and the appearance of Jesus in the Cenacle become understandable, because—if this reasoning is right—Jesus is, was, and will forever be the perfect union of matter and energy and spirit. And, of course, accepting this reasoning one can see that the consecrated communion host is real. If this reasoning is accepted to be theologically and logically valid, it leads to a further observation. The study of singularities is not concluded by the study of matter alone, or energy alone, or spirit alone. It is the integration of the three worlds that might yield a better understanding of singularities as well as a better understanding of the world as a whole. The study of singularities cannot be eschewed by science. Science cannot thus limit itself. Indeed, as various technical studies of the Shroud of Turin prove, science has an essential role to play in the analysis and the distinction of true from false singularities. The author wishes to acknowledge the technical assistance received from his long-standing collaborator, Louis J. Ronsivalli, an MIT food science technologist, and a most positive feedback from Dr. F. Hadi Madjid, a Harvard physicist. The paper has greatly benefited from comments and recommendations from six referees on an earlier draft. Thanks also go to Jonathan F. Gorga for invaluable editorial assistance. Einstein, A. (1905). “Ist die Trägheit eines Körpers von seinem Energieinhalt abhängig?” (Does the Inertia of a Body Depend upon its Energy-Content?). Annalen der Physik. Ser. 4, Vol. 18, pp. 639-641. See also, [1935 (1971)]. “Elementary Derivation of the Equivalence of Mass and Energy”. American Mathematical Society, Bulletin. Vol. 41, pp. 223-30. In R. W. Clark. Einstein—The Life and Times. New York and Cleveland: World Publishing, p. 538; see also pp. 98-103, 115-120, 126, 141, 144, 268, 537, and 587. Allen, R.G. D. (1970). Mathematical Economics, 2nd edn. London and New York: Macmillan, St. Martin’s, p. 748. Capra, F. (1980). The Tao of Physics. New York: Bantam Books. Cf. Feinstein, J. S. (2006). The Nature of Creative Development. Stanford: Stanford Business Books, esp. pp. 303-315 and 322-328. Einstein, A. (1946). In Nathan O., and Norden, H. eds., Einstein on Peace. New York: Avnet Books, 1981 ed, p. 376, from a pamphlet published by Beyond War in 1985 entitled A New Way of Thinking. Gorga, C. (1999). “Toward the Definition of Economic Rights”, Journal of Markets and Morality Vol. 2, No. 1, pp. 88-101. Gorga, C. (2002). The Economic Process: An Instantaneous Non-Newtonian Picture. University Press of America, Lanham, Md., and Oxford. Thompson, J. M. T. (1986). Nonlinear Dynamics and Chaos, Geometric Methods for Engineers and Scientists. New York: Wiley. For poetry, Walt Whitman’s work should suffice. For philosophy, see. e.g., Hegel, G. W. (1807). The Phenomenology of Spirit and Emerson, R. W. The Natural History of the Intellect (or The Natural History of the Spirit) unpublished. Dawson, C. In Catholic Educator’s Resource Center (CERC), Bi-Weekly Update, November 5, 2004. At www.catholiceducation.org. Einstein, A. (1941). “Science, Philosophy and Religion: a Symposium”. From The Quotation Page at http://www.quotationspage.com/quote/24949.html. Lukacs, J. (2002): At the End of an Age. New Haven and London: Yale University Press. Carmine Gorga is a former Fulbright scholar and the recipient of a Council of Europe Scholarship for his dissertation on ”The Political Thought of Louis D. Brandeis.” Using age-old principles of logic and epistemology, in a book and a series of papers Dr. Gorga has transformed the linear world of economic theory into a relational discipline in which everything is related to everything else—internally as well as externally. He was assisted in this endeavor by many people, notably for twenty-seven years by Professor Franco Modigliani, a Nobel laureate in economics at MIT. The resulting work, The Economic Process: An Instantaneous Non-Newtonian Picture, was published in 2002. For reviews, see http://www.carmine-gorga.us/id18.htm. During the last few years, Mr. Gorga has concentrated his attention on matters of methodology for the reunification of the sciences. International Journal of Mathematics, Game Theory and Algebra, 2010, vol. 19, issue 4, pp. 235-244. Carmine Gorga is a former Fulbright scholar and the recipient of a Council of Europe Scholarship for his dissertation on ”The Political Thought of Louis D. Brandeis.” Using age-old principles of logic and epistemology, in a book and a series of papers Dr. Gorga has transformed the linear world of economic theory into a relational discipline in which everything is related to everything else—internally as well as externally. He was assisted in this endeavor by many people, notably for twenty-seven years by Professor Franco Modigliani, a Nobel laureate in economics at MIT. The resulting work, The Economic Process: An Instantaneous Non-Newtonian Picture, was published in 2002 and it is currently being reissued in an expanded version. For reviews, see http://www.carmine-gorga.us/id18.htm. During the last few years, Mr. Gorga has concentrated his attention on matters of methodology for the reunification of the sciences. While the structure of mathematics is built on an uninterrupted series of equivalence relations, the number system is constructed as a linear progression. To eliminate this dichotomy, the present paper, without affecting the inner workings of the number system, attempts to consider zero, one, and infinity as three distinct entities, unlike the numbers 2, 3, or 4, and ties them together into an equivalence relation. This pivotal operation transforms mathematics from a linear to a relational discipline: Each foundational element is related to the rest of mathematics and to the outside world. After observing some of the canonical requirements of the equivalence relation and the fundamental advantages of casting thought processes into this format, the paper calls attention to some of the major links in the series of equivalence relations on which mathematics is built. Equivalence is not composed of a mechanical addition of one element to another, as in the linear relation of 0, 1, 2, 3… ∞: 0 + 1 + ∞ is meaningless. Rather, it searches for the most important elements in a set and interlocks them. This approach transforms a linear mode of thinking into a relational one. Hence the paper proposes that the most fundamental relation in mathematics is the equivalence of Zero to One to Infinity; in traditional notation, 0 ≡ 1 ≡ ∞; or, 0 = 1 = ∞; and, in different notation, 0 ↔ 1 ↔ ∞. As can be seen, nothing changes but our mode of thinking about the number system: The system is all there, but changed from a linear to a relational apparatus. If the present proposal stands all the tests of validity, this solution will eventually yield two considerable benefits. This internal transformation (1) reveals some inner characteristics of mathematics that are shielded from plain view and (2) tends to facilitate the eventual re-unification of the physical with the social sciences. The number system is conceived as proceeding from zero to one to infinity. This is a progression that leaves the three fundamental entities of mathematics—namely zero, one, and infinity—unrecognized and unrelated to each other or related to each other in a linear mode of thought. This linear linkage leads the mind to an empty progressio ad infinitum. This condition leaves mathematics serving, yet conceptually isolated from, all other mental disciplines. The proof is that each one of the three terms, namely zero, one, and infinity are conceived as being identical in form to the number two, three, and all other numbers (the ever incomplete listing of which yields one of the approaches to the meaning of infinity). As such, zero, one, and infinity are left unidentified as in the Hegelian night in which all cows are black. In reality, all numbers are not equal. As will be seen, those entities are three fundamentally distinct building blocks of mathematics. While the relationship tying zero to one and to infinity is conceived as being linear, the equivalence relation stands as part and parcel of all of mathematics. It stands at the very foundation of the number system, in which three fingers of the hand (3 of base 10 number system) are equivalent to a word/number/symbol—namely, three, 3, or III—and to the three apples in front of our eyes. All algebraic relations are equivalence relations. A system of equations is based on the equivalence relation. A triangle is based on the equivalence relation. The whole of trigonometry is based on the equivalence relation. Indeed, as R. G. D. Allen points out, the rules of equivalence “hold” also for the relation of “equality (=)”.1 Hence, 1 = 1 is an equivalence relation, because its validity stands on the proof that 1 = (6 – 5) or any other such relation. Hence, in extenso, 1 = 1 ought to be written 1 = (6 – 5) = 1 or 1 = (6 – 5) = (7 – 6). The equivalence relation starts in logic and has the widest possible range of application outside of mathematics as well. All forms of syllogism are based on an equivalence relation; most religions are based on an equivalence relation. Hence the relation of equivalence is well known to theologians, philosophers, and the literati. As logicians—and mathematicians—know, to be valid an equivalence relation must be composed of three terms. The three terms have to be reflexive (identical to themselves throughout the discourse), symmetric (one observes the same entity from two points of view in order to obtain a deeper understanding of both entities), and transitive (a third term must exist to which both terms are equivalent in order to eschew the confines of circular reasoning, to observe the same entity from three points of view or have a triple check on our reasoning, and to complete the analysis). With the assistance of the equivalence relation the terms of the analysis do not start from an arbitrary point and end at an arbitrary point, but are strictly interlocked. These observations can be made more certain by specifying why science eschews all singularities. There is a good reason for this practice. Punctilionism, the defense to the death of a single point unrelated to the rest of the universe, is not analysis. A single event does not lead to an objective, replicable analysis or experiment. Analysis begins with the observation of two events. Yet, the observation of two events necessarily leads to circularity of reasoning. Faced with two observations, one is obliged to observe all possible relationships between them. Hence, the mind is led back to the exploration of all potential outcomes of the position of Point B on the circumference in relation to Point A at the center of the circle. This is a process that eventually leads to the reversal of one’s position (an 1800 turn) and then to a return to one’s original position—and no certainty is acquired in the meantime. Therefore, science asks for a third term. The third term points the research in the right direction. If the third term is placed in a linear relation-position-alignment, however, the end result might be a dispersal of the thought process into the empty infinity of an enlarged circle. Again, linearity leads to progressio ad infinitum. It is the equivalence relation that restrains the analysis from collapsing into infinity by constraining the terms into an interlocked relationship as in its standard configuration: A ↔ B ↔ C. In brief, there are many reasons why it is essential to cast any scientific analysis in the format proposed by the rules of logic in general, and the principle of equivalence in particular. A few of them, not necessarily in their order of importance, are as follows. Logic, as a whole, provides objective criteria for the evaluation of any proposition; most disagreement, as is well known, disappears as soon as the magic words are pronounced: “But that is not logically tenable.” Logic provides guidance to the analyst; without it, the analyst is rudderless. Thanks to the rules of logic, it becomes apparent whether or not the analysis is complete. Logic makes it possible to replicate the reasoning or the experiment. From the above it inexorably follows that, in the number system is commonly conceived, the relationship that exists between zero, one, and infinity is linear and unspecified; namely, it is 0 → 1 → ∞. The terms do not make an equivalence relation. The terms are thoroughly specified when it is recognized that the relationship linking them is a relation of equivalence, namely when they are linked in this form: 0 ↔ 1 ↔ ∞. There are various reasons why the present linear conception of the number system is inadequate. The most important one perhaps is that placing zero, one, and infinity in a linear relationship to each other condemns the number system, and by extension the whole of mathematics, to remain a closed entity separate from all other forms of thought. Where is the relationship between mathematics and poetry? Or philosophy? Or religion? Also, by placing the three terms in linear succession with each other, they become an indistinct part of the number system: 0 is a number just as 1 is a number; and 0 occupies a position just as 1 occupies a position on the number list. Thus they lose their distinct identity, and cannot be defined: More specifically, they cannot be defined in a manner that, ideally, might satisfy everyone once and for all. In addition, it will be seen that the closed world of mathematics provides a faulty and misguided sense of certainty to the rest of the intellectual community; instead, by ascertaining and affirming the truth about its own modus operandi, mathematics could indeed offer much useful guidance. Figure 1 can be interpreted not only to mean that Zero is a different aspect of One and One is a different aspect of Infinity, but also along these lines: The mathematical world which controls so much of our lives has to be observed first from the point of view of Zero, then from the point of view of One, and then from the point of view of Infinity. The essential prerequisite is to see these three elements of the number system not in a linear fashion, but in a relational mode, namely as three separate and distinct viewpoints of the same system. The easiest method to realize that the three entities are inextricably related to each other is to superimpose the three rectangles forming Figure 1 upon each other at once, alternatively by separately placing each one of the three rectangles on top of the other two. Two rectangles then are obstructed from view, but they remain stubbornly there. Indeed, it is then that we come to the full realization that only by distinguishing the three entities from each other can we hope to understand all three of them. Otherwise, we reduce the construction to a singularity; or lock it into circular reasoning, if we were to deny either the reality of Infinity or the reality of Zero. When the analysis is completed, it is possible to see that the total reality in which the number system is immersed can be grasped only if it is observed, not only from the viewpoint of One, but also from the viewpoint of Zero and Infinity. Through a set of equivalence relations, in the night of time we built the number system. We posited 1 + 1 = 2. This last entity, 2, is a convention. The magic—or creative synthesis, as Benedetto Croce pointed out—is in the sum of 1 plus 1; and then another magic is in the universal acceptance of the convention that 2 equals the sum of 1 plus 1. Following the same reasoning, we built the entire number system. On the positive side. The negative side is not a new chain, but a symmetric reversed chain: -1, -2, etc. The proof can be constructed by following this evidence: 1 – 1 = 0, just as (-1) – (-1) = 0. The number system forms a well recognized unit of thought. The seed of this system is all contained in the entity that we call One. And from One, as briefly seen above, we gradually pass to the initial understanding of Infinity through both the positive and the negative chain of numbers. A fuller understanding of Infinity is contained in the realization that, just like One, the entity that we call Infinity is a whole unit in itself; it is a complete system: it is a “full” set—a set whose understanding is approached by the inclusion in it of the entire number system. Similarly, the entity that we call Zero is the “empty” set—a set whose understanding is approached by subtracting one number at a time from the number system until we are left with no more numbers. This empty set, this null set, is a whole entity in itself. The briefest possible proof that Zero is not “another” number is contained in the realization that Zero is not the half point between all positive and all negative integers: Since both chains are infinite, every point on them is the half point. Furthermore, Zero is not another number because we are not able to distinguish whether it is derived from 1 – 1 or from (-1) – (-1). Were it necessary, the practical function of Zero as indicating position could be replaced by any other symbol, such as a forward slash, without altering the structure or the integrity of the number system. In other words, we reach a fuller understanding of the set we call One by putting it in relation with the set we call Infinity as well as the set we call Zero. We enter into the world of One precisely as we have done ever since the dawn of civilization, by observing things and counting them with the help of our fingers. Once we begin to recognize that there is no end to the number system we enter the world of Infinity. Thus we come back to the very roots of our civilization. Our ancestral ancestors—not unlike many brothers and sisters in many civilizations of today—started their analysis of the world with the understanding of the number One. Then they jumped off to the understanding of such an esoteric concept as the world of Infinity. Only relatively recently in the history of civilization have we discovered the need to understand the world of Zero. How do we define these entities? Indeed, it might be forever impossible to define One if it were not for the concept of Infinity. Thus, calling for assistance on the principle of non-contradiction, it can be said that One is not-Infinity. Yet, both One and Infinity would forever remain locked into a circular relationship if both concepts were not anchored in the reality of Zero. With the inclusion of this third element, we can now distinguish One from Infinity, not simply by saying that One is not-Infinity, but by specifying that One is the beginning of a set that separates itself from Zero and tends to Infinity. Similarly, it might be forever impossible to define Infinity if it were not for the concept of Zero. Thus, calling again for assistance on the principle of non-contradiction, it can be said that Infinity is not-Zero. By extension, we can now say that Infinity is a full set, while Zero is an empty set. Yet, both Infinity and Zero would forever remain locked into a circular relationship if both concepts were not anchored in the reality of One. With the inclusion of this third element, we can now distinguish Infinity from Zero, not simply by saying that Infinity is not-Zero, but by specifying that Infinity is the end/beginning of a set that starts with One. In turn, since Zero is not-One, Zero is also not-Infinity. It is by subtracting, one by one, all the content of Infinity—one by one all the numbers from the number system—that we reach the concept of Zero. Zero then is the symmetric, but negative, image of Infinity. It is only by understanding Zero that we can conceive of Infinity; and only by understanding Infinity that we can conceive of Zero—and indeed One. Zero, One, and Infinity can be understood only in relation to each other. Zero is the other face of Infinity; One is the other face of Zero; Zero is the emptiness of Infinity; One is the fullness of Infinity; Infinity is the fullness of One and the emptiness of Zero; One is the limit between Zero and Infinity or, conversely, One is the separation of Zero from Infinity. The terms are reflexive, symmetric, and transitive. As used in this paper, One is a relation, the relation that binds Zero to Infinity. One is the link, the glue that holds the world of Zero and the world of Infinity together. It keeps both Zero and Infinity factually together and intellectually separate from each other. With the word One, we stop thinking of the universe of mathematics as a linear relationship in which Zero loses its distinction and its existence when it inexplicably passes into One and eventually into Infinity, and we start conceiving the three terms of the universe of mathematics as being three whole entities—complete in themselves and in organic relationships with each other. We can then study the objective reality of the number system first as the world of One, then as the world of Zero, and then as the world of Infinity. Each term is an enclosed world of its own. Observed at a very broad level of generality, some of the implications for mathematics of locking Zero, One, and Infinity into a relation of equivalence are as follows. The number system is no longer composed of an infinite series of elements; it is composed of a comprehensible series of three elements, the world of One, the world of Zero, and the world of Infinity. These three elements are no longer independent of each other but are strictly interconnected. It is through the word One that we reach a better understanding of both Zero and Infinity. Through the concept of One, we enter deeply into the essence of both Zero and Infinity and we extend our intellectual grasp to encompass both of these totally abstract entities. More importantly perhaps, by trying to define One as an infinite entity into which both Zero and Infinity are encompassed, and indeed are One, we realize that this is an infinite world in which we—observers—are all encompassed. Conversely, we can look at the world of Zero or the world of Infinity by realizing that they also encompass the world of One. Thus the utmost hope is that, having reached this level of understanding of the number system, we might gain greater control over the forces of this world by regaining the sense of interconnectedness that links everything to everything else. The most evident and practical consequence of transforming mathematics into a relational discipline is the need to jettison the old attachment to absolute quantification. Quantification in mathematics has always taken place within sharply defined limits. Thus, taking a leaf from the transition from Galileo and Newton to Einstein through Hume in relation to space and time,7 we shall not be concerned with absolute but with relative quantification. We shall conclude that quantification is never absolute; it is always relative. And it might forever remain relative. In order to reduce a possible level of apprehension about this condition, we might notice that mathematics has always been subject to this condition. Mathematics, the most precise of all sciences, proceeds on the basis of two incommensurable entities, namely Zero and Infinity. Indeed, on second thought, mathematics presents us, not with an absolute but with a relative quantification of its third foundational term as well: One, One as symbolic representation of the number system as a whole. The number system is infinite; hence, it is incommensurable. One is incommensurable. Needless to say, this is not an advocacy of not measuring things that can be measured. From these considerations there ensues a surprising and interesting consequence. Blind believers in the powers of mathematics have imparted a wrong sense of security to the world. From every corner it is heard: Measure things, quantify them, number them—and you shall acquire certainty. Through the equivalence relation of Zero to One and Infinity, it becomes utterly clear that mathematics does not impart any sense of certainty to the world. None of its three foundational terms can ultimately be numbered or transformed into a measurable or quantifiable entity. What is invaluable is that mathematicians do know it and have learned how to cope with their world of uncertainty. They have invented the instrument of the limit—whereby numbers, proceeding from (plus or minus) One, approach Zero and Infinity, but never quite reach them. Thus mathematicians, from being the most abstract of all people, turn out to be the most concrete and practical ones indeed. In 1946 Einstein remarked: “The unleashed power of the atom has changed everything save our modes of thinking”.9 With the establishment of the equivalence of Zero to One and to Infinity, while the number system remains as intact as before, our modes of thinking about mathematics change and transform this discipline from a linear to a relational entity. And then (potentially) everything changes. From the linear world of Cartesian logic and rationalism, everything is transformed into the organic world of relationalism in which—as proved by the Internet—everything is indeed related to everything else. Above all, beyond changes of perspective in mathematics, if the proposed construction of the number system is accepted as valid, with time, the warlike relation between the “two cultures”—with its multifarious manifestations of reductionism, materialism, and atheism, and, above all, mutual misunderstandings—will, through mutual adjustments, unavoidably come to a screeching halt. Mathematics is no longer the fount of all certainty; if neither Zero, nor One, nor Infinity is a measurable entity, mathematics is as imponderable as all other mental disciplines. This is a verity that is well-known to insiders (Kline 1980);10 yet, it does not seem to have yet percolated among non-mathematicians. If there is such a thing as certainty, it exists outside the realm of mathematics. The author wishes to acknowledge the technical assistance received from his long-standing collaborator, Louis J. Ronsivalli, an MIT food science technologist, and a most positive feedback from Dr. F. Hadi Madjid, a Harvard physicist. This presentation has greatly benefited from comments and recommendations from six referees on an earlier draft of this paper. Thanks also go to Jonathan F. Gorga for his invaluable editorial assistance. 1. R.G. D. Allen, Mathematical Economics, 2nd edn, p. 748 (London and New York: Macmillan, St. Martin’s, 1970). 2. C. Gorga, ‘Toward the Definition of Economic Rights’, Journal of Markets and Morality 2, 88-101 (1999). 3. C. Gorga, The Economic Process: An Instantaneous Non-Newtonian Picture (Lanham, Md., and Oxford: University Press of America, 2002). An expanded edition is in press. 4. C. Gorga, “Concordian economics: tools to return relevance to economics”, Forum for Social Economics (forthcoming). 5. C. Gorga, “On the Equivalence of Matter to Energy and to Spirit”, Transactions on Advanced Research 3, 2, 40-47 (2007). 6. J. M. T. Thompson, Nonlinear Dynamics and Chaos, Geometric Methods for Engineers and Scientists (New York: Wiley, 1986). 7. Cf. J. S. Feinstein, The Nature of Creative Development, esp. pp. 303-315 and 322-328 (Stanford: Stanford Business Books, 2006). 8. B. B. Mandelbrot, The Fractal Geometry of Nature, p. 25 (New York: W. H. Freeman and Company, 1982). 9. A. Einstein. In Nathan O., and Norden, H. (eds), Einstein on Peace, p. 376 (New York: Avnet Books, 1981) and a pamphlet published by Beyond War in 1985 titled A New Way of Thinking. 10. M. Kline, Mathematics: The Loss of Certainty (New York: Oxford University Press, 1980). 11. For poetry, W. Whitman’s work should suffice. 12. For philosophy, see. e.g., G. W. Hegel, The Phenomenology of Spirit (1807) and R. W. Emerson, The Natural History of the Intellect (or The Natural History of the Spirit) unpublished. 13. C. Dawson. In Catholic Educator’s ResourceCenter (CERC), Bi-Weekly Update, November 5, 2004. At http://www.catholiceducation.org. 14. A. Einstein, ‘Science, Philosophy and Religion: a Symposium’ (1941). In The Quotation Page at http://www.quotationspage.com/quote/24949.html. 15. J. Lukacs, At the End of an Age (New Haven and London: Yale University Press, 2002). 16. Kline, op. cit. (note 8) p.7.